President Trump's brand is becoming too toxic for a growing number of America's CEOs. Within 24 hours on Monday, the chief executives of Under Armour (UA), Intel and Merck (MRK) quit Trump's manufacturing council in protest over his initial failure to condemn white supremacists. The president of the Alliance for American Manufacturing followed suit by quitting on Tuesday. These public stands are highly unusual. CEOs are loath to alienate customers through politics and never want to be the target of a tweet storm from Trump. But corporate leaders who were once eager for a seat at the Trump table are increasingly deciding the costs outweigh the benefits. "There is a herd effect. With each CEO's announcement, it becomes easier for the next CEO to take a stand -- and the pressure goes up to do so," said Timothy Calkins, a marketing professor at Northwestern University's Kellogg School of Management. Grassroots organizations are pleading with more corporate leaders to take action. Color of Change, a racial justice organization, is mobilizing a campaign called #QuitTheCouncil aimed at convincing Pepsi's (PEP) Indra Nooyi and others to immediately cut ties with Trump. "We will not forget those who remained silent," the petition warns. Other high-profile execs like General Motors (GM) CEO Mary Barra and Campbell Soup (CPB) boss Denise Morrison could face similar pressure. On Monday, Merck CEO Kenneth Frazier, one of the nation's most prominent black CEOs, stepped down from the president's manufacturing council following Trump's reluctance to denounce white supremacists who rallied in Charlottesville, Virginia, over the weekend. The demonstrations turned violent, and a counter-protester was killed. Frazier cited a "responsibility to take a stand against intolerance and extremism" in leaving the council. Two more CEOs, Under Armour's (UA) Kevin Plank and Intel boss Brian Krzanich, dumped Trump on Monday night -- even after the president responded to two days of criticism by calling the KKK, neo-Nazis and white supremacists "evil." Trump fired back at the CEOs, calling them "grandstanders" in a tweet on Tuesday. The Alliance for American Manufacturing President Scott Paul announced his departure shortly after Trump's tweet. Larry Summers, a vocal Trump critic and former adviser to President Obama, has called on all CEOs to quit Trump's advisory boards. Trump's corporate advisers "should feel ashamed for complicity in Mr. Trump's words and deeds," Summers wrote in an opinion piece in the Financial Times. "I sometimes wonder how they face their children." The four executives who left the manufacturing council weren't the first powerful business leaders to part ways with the Trump White House. Earlier this year, Trump's stances on immigration and climate change fueled the resignations of Tesla (TSLA) founder Elon Musk (from two separate boards), Disney (DIS) CEO Bob Iger and former Uber chief Travis Kalanick. 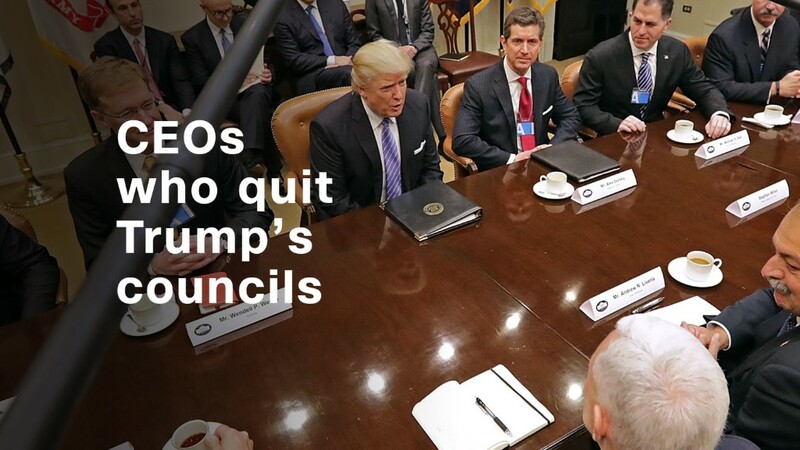 Several CEOs indicated this week that they are staying on Trump's manufacturing council, including Campbell Soup's (CPB) Morrison, Michael Dell, General Electric (GE) CEO Jeff Immelt, Dow Chemical (DOW) CEO Andrew Liveris and Whirlpool (WHR) boss Jeff Fettig. Lockheed Martin CEO Marilynn Hewson declined to comment, while others such as Caterpillar (CAT) CEO Doug Oberhelman and Boeing (BA) CEO Dennis Muilenburg were unreachable. Trump's other major advisory board, the strategic and policy forum, includes JPMorgan Chase (JPM) CEO Jamie Dimon, BlackRock (BLK) founder Larry Fink, Blackstone (BX) co-founder Stephen Schwarzman and GM's Barra. "Unquestionably, CEOs would prefer to remain silent. But at what point do they feel the risks of silence outweighs the risk of taking a public stance?" asked Bill Boulding, dean of Duke University's Fuqua School of Business. Some, like Under Armour's Plank, must be worried about protecting their companies' brands. They fear turning off customers by being too closely linked to a controversial president with historically low approval ratings. "I love our country & company. I am stepping down from the council to focus on inspiring & uniting through power of sport," Plank said in a statement. CEOs must also stand up for their employees, some of whom may feel under attack by certain policies or statements. If they don't, they risk losing talent. "You want your employees to know you have their backs," said Boulding. Of course, Frazier's resignation shows that quitting Trump carries serious risks, too. Trump tweeted late Monday demanding that Merck "bring jobs back & LOWER PRICES!" Companies like Lockheed Martin (LMT), which rely on the federal government for lucrative contracts, may also worry about a backlash from a White House that is notoriously sensitive to criticism. "You never want to get on the wrong side of an administration -- because it has an incredible ability to make your life difficult as a corporate executive," Calkins said. That's why it's so telling that CEOs are increasingly willing to run that risk.